PHARR — Federal Emergency Management Agency representatives this week began distributing information about federal assistance available for residents impacted by floodwater. The disaster declaration issued by President Donald Trump last week triggered the availability of federal funding, such as grants and loans, for residents impacted by storms last month, which the National Weather Service estimates caused flooding and rainfall amounting to about 18 inches between Weslaco and Mercedes. “Drainage was unable to handle the deluge, and widespread flooding with photo and video evidence of at least 3 to 5 feet of water depth in many streets of each town ensued,” according to information provided by the NWS. The floods left more than 2,000 homes damaged in Weslaco alone, and the NWS estimates that total damages could surpass $100 million and up to $500 million in the region, which also includes Zapata, Jim Hogg, Brooks and Kenedy counties. Federal Emergency Management Administration's Ramon Colon, left, and Luis Burgos walks down Scurlock road, placing fliers on flood assistance on homes on Friday, July 13, 2018, in Pharr. 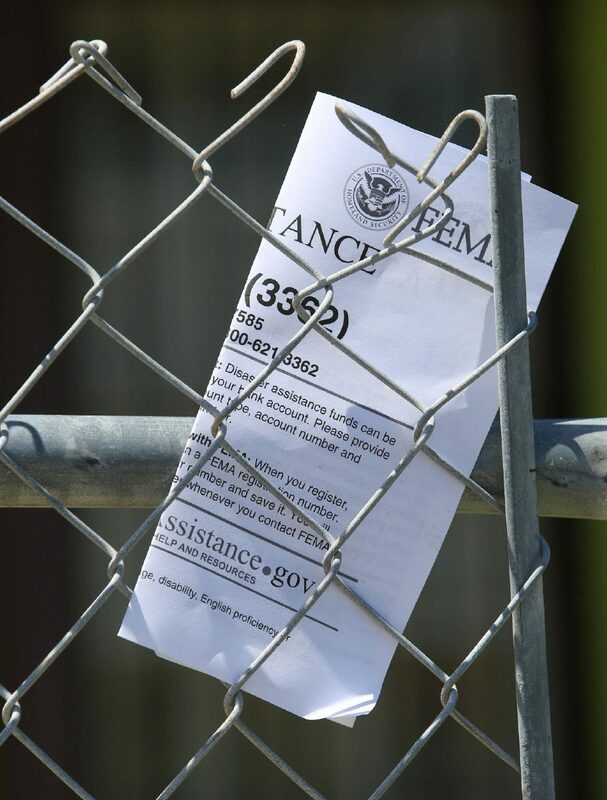 A FEMA flier is left for a resident on Scurlock road Friday, July 13, 2018, in Pharr. FEMA Disaster Survivor Assistance crews went door-to-door in the Las Milpas area on Friday, handing out flyers and signing up residents who had not yet filled out the necessary forms required to be eligible for aid. “We’re going to be around, doing the canvassing, going door-to-door” said Ramon Colon, who works for the disaster survivor assistance division of FEMA. 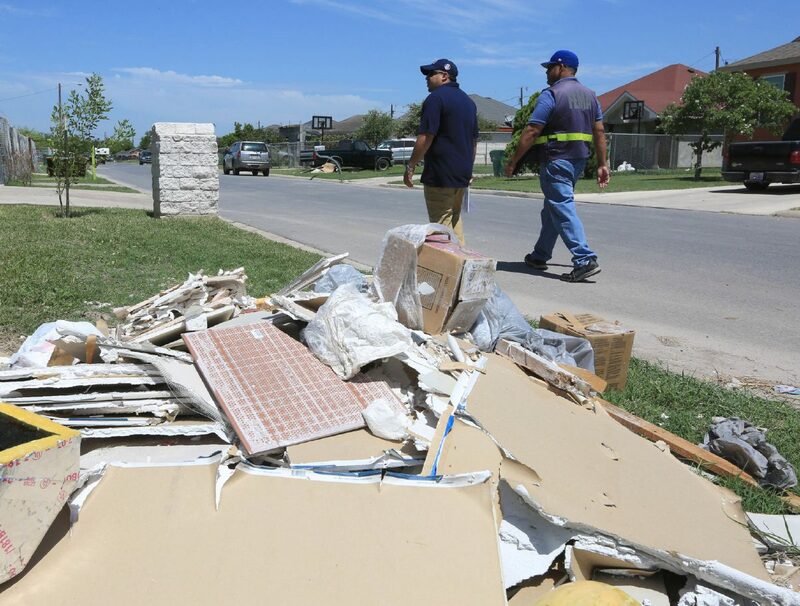 Though homes near East Mavi Drive in the Las Milpas area sustained “regular damage,” other homes, like in the Mercedes and Weslaco area, were damaged severely, Colon said. Crews will also be canvassing those areas. The FEMA crews work from Monday through Saturday from 7 a.m. to 7 p.m.
“FEMA encourages everyone to register, if they have damage,” Colon said, adding that homeowners and renters should consider applying if water entered their property. The disaster survivor assistance teams also encourage residents to contact their flood insurance, but insurance coverage is not necessary to be considered for federal assistance. Residents requesting disaster assistance will be given an identification number used to lookup their application status. Inspectors will then conduct damage assessments of property within 10 business days of receiving the application, Colon said. FEMA, a division of the U.S. Department of Homeland Security, requires that at least one resident in the household be a U.S. citizen, non-citizen national or qualified immigrant to qualify for assistance, according to information provided by the agency. Crews, though, do not check citizenship status of members in the households. 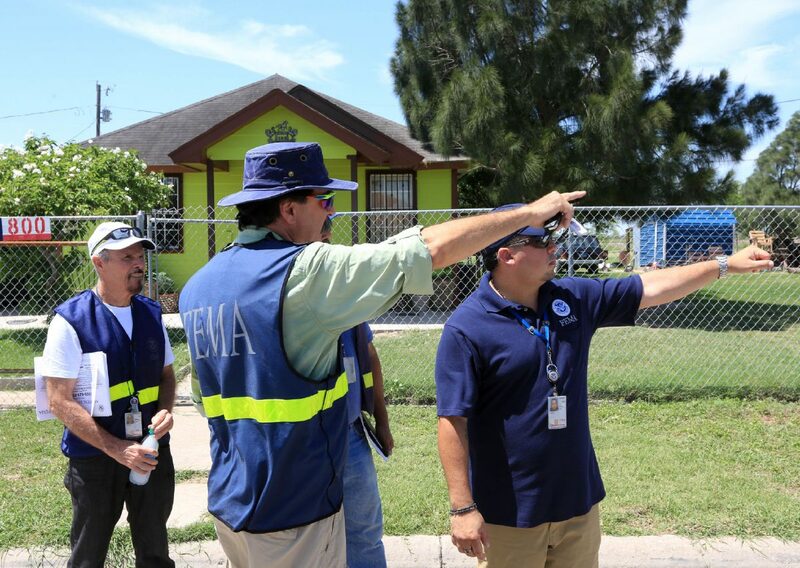 FEMA representatives identify themselves when approaching homeowners and wear government-issued badges. Flyers with information about disaster assistance may also be left at temporarily unoccupied homes. Residents in the declared disaster area may also apply for assistance by calling FEMA at (800) 621-3362 or online at www.disasterassistance.gov. “We’re going to continue working the area until they need us,” Colon said.